Goal Zero Heroes program recognizes safety champions — Citadel Pacific Ltd.
Two of IP&E’s Goal Zero Heroes (GZH) were recently recognized as Shell’s Safety Heroes for two consecutive quarters in 2017. Shell Safety Heroes is an award program by Shell Lubricants Macro Distributors (MD). 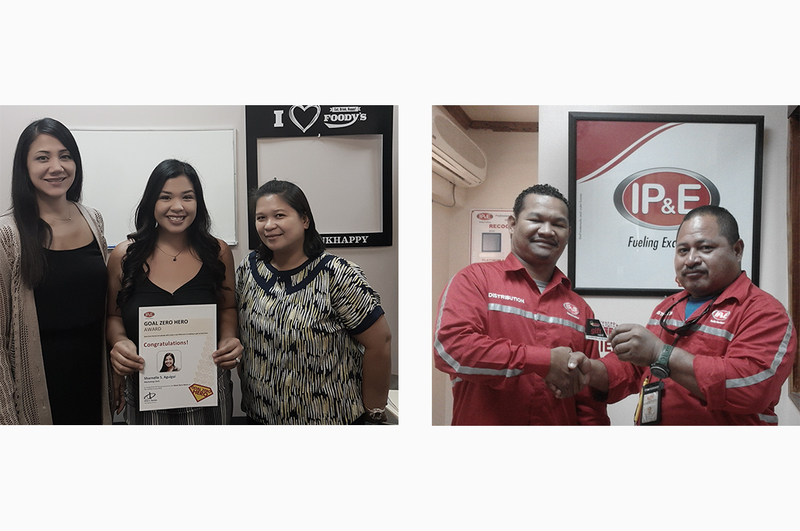 IP&E Fuel Tank Driver Timothy Patris and IP&E Retail Marketing Clerk Sharnelle Aguigui were recognized as the first and second quarter Safety Champions at the Shell Safety Hero Program. The GZH program allows IP&E’s senior leaders to give recognition to employees who contribute to achieving Goal Zero, No Harm, No Leaks, and No Violations, the overarching safety goals of the company. The chosen “heroes” demonstrate mastery of the HSSE Golden Rules, consistently promote the 12 Life Saving Rules, and encourage others to do the same. It also aims to promote safe and compliant behaviors of IP&E employees both at home and in the workplace. Adopted from Shell, the program was localized to suit the needs and requirements of IP&E.